Time-Life has released a terrific compilation DVD of Glen Campbell Good Times Again, a brief but entertaining collection of song selections from Campbell's hugely successful 1969-1972 CBS variety series. 16 songs are featured here, most of them duets performed by Glen with such artists as Johnny Cash, Roger Miller, Bobbie Gentry, Linda Ronstadt, and Ray Charles. As an added bonus, Glen Campbell introduces each segment, giving some good background info on his old series and on the various performers appearing on the disc. 1969 was a busy year for Campbell. After years of being one of, if not the, most sought-after session guitarists in the business (including being a Beach Boy when Brian Wilson opted out of touring in 1965-1966), Campbell branched out into a solo career, eventually knocking out huge hits like Gentle on My Mind, By the Time I Get to Phoenix, Wichita, Galveston, and Wichita Lineman. John Wayne, clued into Campbell by Wayne's young daughter, personally selected him to co-star in his Oscar-winning Western, True Grit. 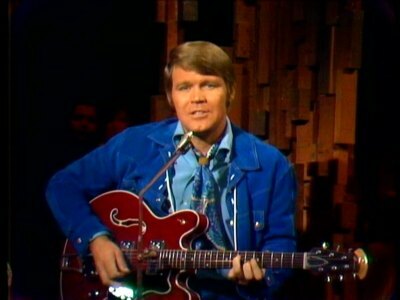 And in January, 1969, Campbell debuted on CBS with The Glen Campbell Goodtime Hour, which, although it was only a mid-season replacement, finished 15th for the year in the Nielsen ratings. I remember quite clearly my parents enjoying Campbell's show, and after watching Glen Campbell Good Times Again, it's not hard to see why. His impossibly clean-cut, boyish good looks, and his easy-going, professionally polished country/pop stylings, had to be a reassuring presence in that rough year of 1969, when popular musicians were more apt to look like Mick Jagger than a Ken doll. I remember liking the show not only for the songs, but because Campbell was such a genuinely funny, genial guy ("Good evening, ladies and gentlemen, I'm Gleeeeeeennnnnn Campbell!"). 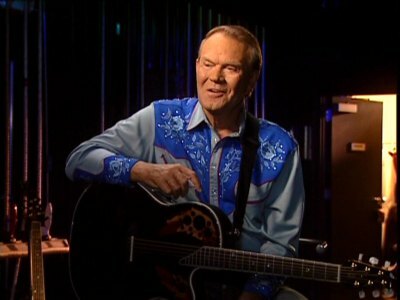 It's hard to see much of that, though, in the Glen Campbell Good Times Again DVD, because very little of the interplay between Campbell and his guest stars remains; the songs are the focal point of this collection, and the video selections are cut very closely to the opening of the songs. Earlier this year, Time-Life released a compilation of episodes from Tom Jones' variety show (please click here to read that review). That compilation had quite a few comedy-only skits included among the song snippets. Here, in the Glen Campbell Good Times Again DVD, only one brief, edited comedy skit is present, featuring the series' producer, Tommy Smothers, of The Smother Brothers comedy duo (it's not very funny). I can't complain that Campbell's songs are exclusively featured here, but I do have to admit that I miss seeing Campbell's infectious enthusiasm when speaking to his guest stars (you can see just a tiny bit of that here when he's speaking to B. J. Thomas). Each song selection is introduced by a newly-shot intro by Campbell, who's low-key and affectionate in his remembrances about his series and the singers who worked with him (although, curiously, there's no intro for Cher). Music rights are such a big stumbling block for DVD releases of vintage TV shows, so if you don't see your favorite singer featured here (and Campbell had the biggest names in the business show up on his series), it very well may be because the music rights proved unattainable. Still, there are some truly memorable duets here with Campbell. 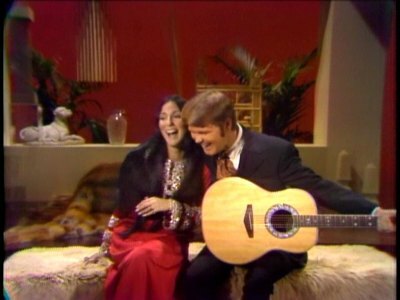 Bobbie Gentry and Glen do a heartfelt rendition of Let it Be Me, while Glen's All I Really Want to Do duet with fellow CBS variety star Cher, is rollicking and quite fun (Cher looks especially pleased to be singing with the big, handsome Campbell). Glen's duet with Roger Miller on the seminal King of the Road would have been perfect had the producers not spoiled it with a goofy chroma key special effect, while Willie Nelson's duet with Glen on Hello Walls is perfectly harmonized (check out square Willie before his makeover). Glen's rocking duet with Johnny Cash on Folsom Prison Blues is probably the highlight of the disc, but for me at least, I particularly enjoyed Glen's solo songs, including True Grit, By the Time I Get to Phoenix, and Galveston. Wichita Lineman leads off the disc, and it's probably the best choice for that spot, because I can't think of a better Campbell song to sum up that singer's particular style. Hearing Wichita Lineman in its proper environment (best heard on a car radio while driving solo to someplace far away) is an amazing experience (it's still one of the best-produced pop singles of the 1960s), and it's great to hear Glen do a live version of it on the show. Hopefully, Glen Campbell Good Times Again will be a success that spurs the release of other collections from this great series. The full frame video presentation of Glen Campbell Good Times Again is particularly sharp and clear; originally shot on video, some of these vintage TV shows shot in that format can look awful after 40 years. But Glen Campbell Good Times Again is remarkably clean, with only a few instances of compression issues. 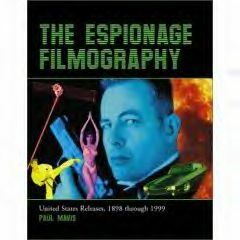 The Dolby Digital mono audio mix accurately reflects the original broadcast presentation. There's a thirteen minute interview with Glen, where he discusses various aspects of his career and the television show, and just like his singing style, he's straight-forward and disarming. Glen Campbell says in one of the intro segments of Glen Campbell Good Times Again that the key to being a great singer is to never get "in front" of the words: let the song sing itself. I can't think of a better way to describe the singing style of one of country and pop's greatest performers. Campbell's CBS variety show in the late 60s and early 70s was a huge hit, and it's easy to see why when you watch the sensational duets featured on the Glen Campbell Good Times Again compilation disc. I highly recommend Glen Campbell Good Times Again.